DHL Express Ireland recently told IrishCycle.com that its drivers using its Dublin city centre base at Pearse Street were warned not to block the cycle lane, however readers are contuining to send us photogrpahs which highlight how illegal loading is continuing multiple times a day most working days. “Our drivers are trained and encouraged to drive safely in accordance with the rules of the road and to show courtesy to other road users,” said John Malone, a senior customer care administrator with DHL Express Ireland Limited. This was followed up with a phone call outlining how drivers had been instructed not to use the cycle lane — however, readers have continued to send us photographs of illegal parking outside the DHL unit at Trinity Central, which is housed in a building owned by Trinity College Dublin. When another Twitter user, Val Cassidy, asked: “If that’s the case, should we just stop pretending we have cycle lanes? 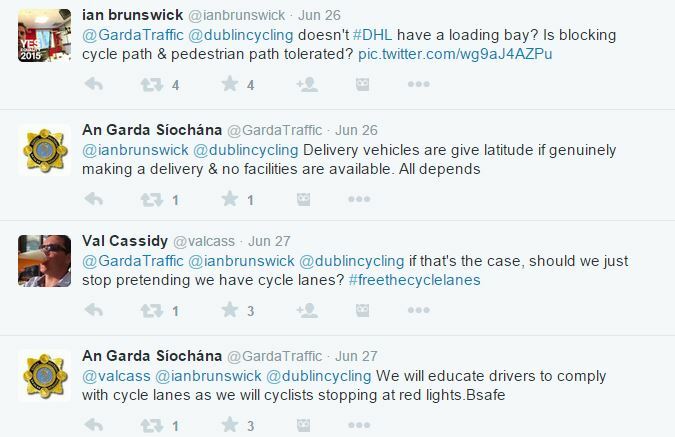 #freethecyclelanes”, the Garda account replied: “We will educate drivers to comply with cycle lanes as we will cyclists stopping at red lights.Bsafe.” There was no mention of red lights in the conversation before this.